Quick input on the C4 300 pockets. They are really hard to put on mostly just because the opening is smaller. You can take some scissors and trim around the opening and they will be easier to put on. Start small - 1/8". If your wearing them barefoot you will want to burn the edge with a lighter and then smooth out the materiel. I've done this to a few pairs with success. Side note - Molchanovs carbon blades (pathos version) on the Cetma pockets has resulted in the least leg burn for me on 40m dives. How do you find the Cetma pockets? I’ve enclosed a photo, side by side with Alchemy V3 and Bleutec Spearo. 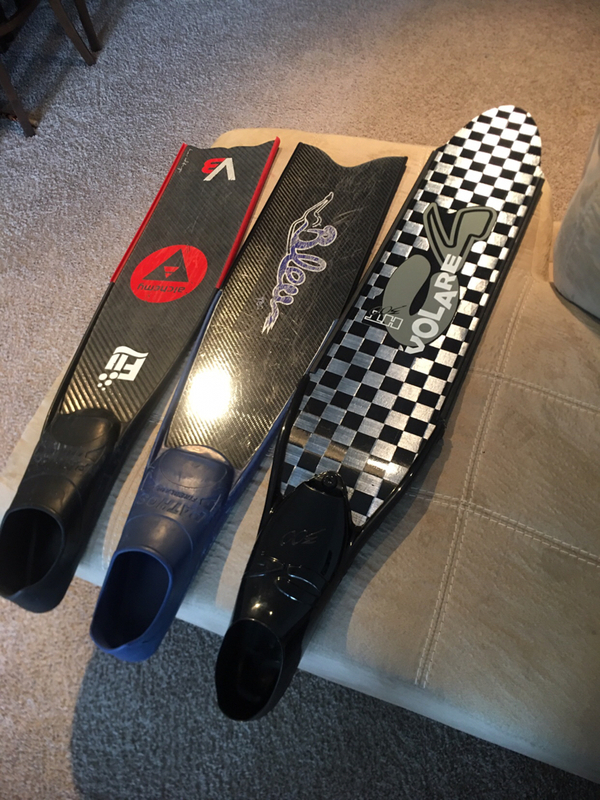 Those are the best fins I’ve ever tried in my option, (mind you, I’ve had the chance to try diveR innegra, cetma, deep apnea and other top brands). I’m predominantly a Spearo around structures such as rigs and wrecks so definitely I’ll have to be extra careful around structures. which stiffness alchemies V3s are these? Sorry, its a question meaning what do you think of them? Ahh, gotcha. They are a great pocket for me. They fit me perfectly. Somewhat average shape. Seems like they won't fit feet with a really high arch - based on what I've seen with customers. They are nice and firm on the bottom yet easy to wear without socks. Super short tendons not adding stiffness via rubber to the blade. They seem durable. Easy to glue on blades. I think they float in the water - which I prefer. Not very hard to get on. Thanks for this tip on the C4 300 pockets. It worked well--a pair of very sharp scissors cuts the material easily. I spent about 10 minutes with scissors, fins, and booties carefully checking contact points and trimming just a bit off at a time to make sure it wasn't too much. End result was a very comfy pocket that I could slip on in a few seconds and have a secure fit even without fin keepers. I have high arches so took very little off the front edge of the foot opening but nearly half an inch off the back part that slips over my ankle.